So, I'm not exactly sure in what era "mint green" in your house was cool, but it's so not cool now, in this era! I mentioned in my last post that I spend a good portion of Memorial Day repainting the stucco walls outside because they were a horrible mint green (btw, I didn't post pictures of the newly painted walls, because they are horribly boring...just plain off white...but SO much better than mint green!). Well, if you thought mint green stucco was bad, take a look at this beauty! Oh yes...that, my friends, is my mint green sink! Yup, in the bathroom that the hubs and I use! I think what makes it even worse is the dark green and maroon tiles around the sink. I mean, who thought that color combination would look good together? And please note the silver "soap holder cut out thingy" behind the sink is placed totally off center...I mean, come on...they couldn't even center it? (It's the little things that drive me crazy! lol). 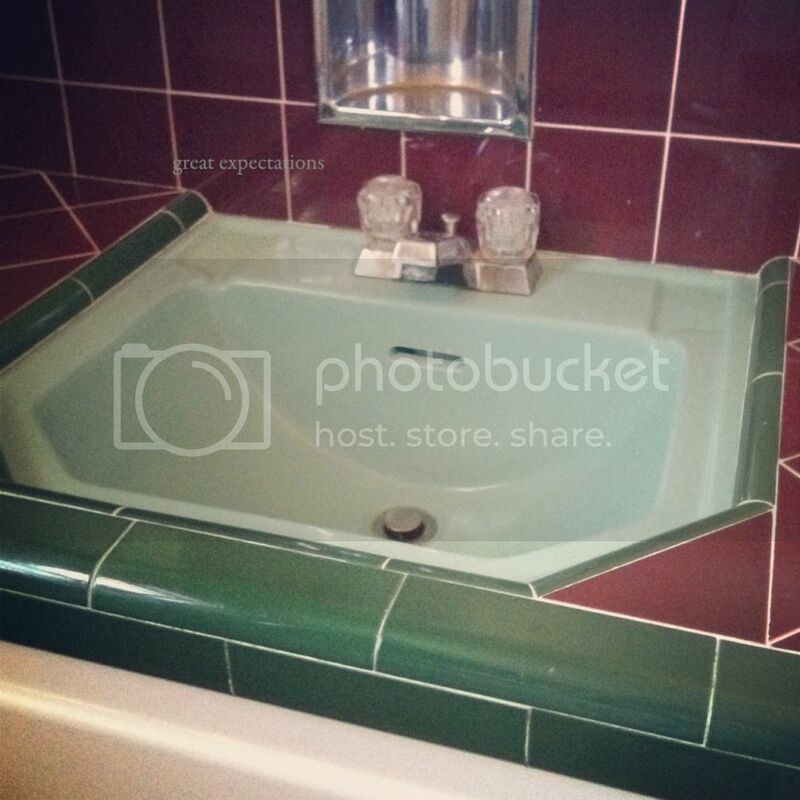 The other bathroom in the house also has hideous tile all over the counter, and a painted enamel sink. That bathroom is done in a lovely shade of pink, which might be even more horrendous than our bathroom except that it happens to be Ellie's bathroom...and that is my saving grace. I can totally make a pink tiled bathroom decently cute for a little girl! We are actually renting this house (saving up for the house of our dreams...we don't want to settle...lol! ), so we won't be doing anything with these "gorgeous" bathrooms other than trying to decorate the best we can. We obviously don't want to do any home improvements to a rental...although, we will be there at least 2 years, so that's a pretty long time to put up with this crazy color scheme! Any decorating ideas on how to make dark green, maroon and mint green look "hip and cool"? Suggestions are greatly appreciated!! I feel your pain. When we moved into our new place last fall, it came with gorgeous dark green carpet! In the whole house might I add ;) Rugs can only cover up so much. I googled alot for suggestions. Good luck to you! Can't wait to see what you do. I think we will be kindred spirits on our house updates! That is a weird combo! Yikes! we currently have an 80s blue, cant wait to move! Maybe you all should just start dressing like they did in the Brady Brunch Days and then the mint and maroon will totally be in style! haha My parents actually had mint green carpet in our house in California...at least I thought it was mint green---the color in your pictures is a little more minty than their carpet was. oh lordy. seriously, where did people come up with these color schemes? I think you're totally right though about being able to make Ellie's bathroom cute, but I too am at a loss about what to do with the maroon and green masterpiece. Can tile be painted?? I moved into my great-gradmother's house a few months ago. We gutted the entire thing though - this sink reminds me of what we took out. I wish I had a crafty way to help! Stopping by from The Coffeehouse and I already love your blog! It's tough when you are in a rental to do fun stuff. Maybe work with the color scheme instead of against it. The only other thing I can think to do would be black, or brown. It's so hard with those colors, I'm not sure what they were thinking. I would probably just go with white towels (maybe textured or patterned) or maroon ones, I wouldn't try to mix in style with that, let the sink be the STYLE, even though it's well, ....hahaha it's not that bad, I know you'll make it look good in there!